Matilda Etches knew how to create maximum dramatic effect from a single fabric. This dress from her last couture collection uses a simple cream silk gauze with sea-green satin stripes. The design relies on fabric manipulation for impact. The pleats of the full skirt are gauged so that each green stripe merges at the waist, and the cream gauze is revealed as the skirt swirls out. The bodice fabric has been pleated diagonally to create a wide swathe of solid green, with the stripes eased gently to create a three dimensional fit over the figure beneath. The effect is light and airy, though the delicate gauze is mounted on a robust boned foundation lining, and there is an underskirt of cream silk. This dress, with the evocative name of 'Spinning Crystal', featured in Matilda Etches' last couture show. She divided her time between England and America, and her final show was held in Los Angeles. 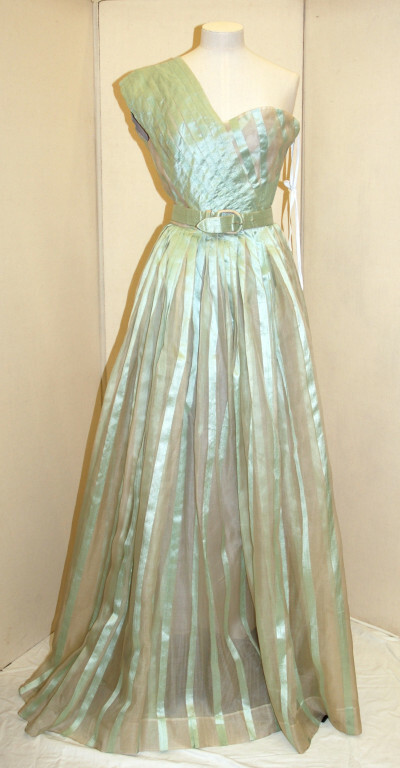 Evening ball gown and belt. 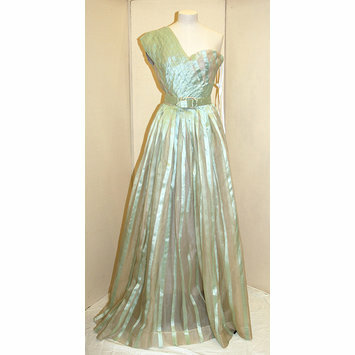 Evening dress with a full skirt, one shouldered bodice and fitted. White silk gauze with opaque turquoise silk stripes. The skirt is pleated so that the stripes merge at the top, the bodice is cut with an asymmetrical drape movement going over one shoulder and over and under the opposite breast, created by stitching opaque stripes together to create a seamed swathe of turquoise silk. The opposite side of the bodice is strapless, with a ruffle around inner top edge. Mounted on a waist stay and boned inner bodice. Lined with silk. With a belt made of leather covered in solid turquoise silk. "I left the West African Dress on the Charles James Dress stand. It looked so well - I just wrapped it up in muslin. The blue and white silk ball dress called Spinning Crystal fits the other stand very well." "If you come across a small programme dated 1956, my last collection from 8181 Sunset Boulevard, Los Angeles, California, I would be most grateful for a copy. The names of the dresses are so amusing and imaginative, such as Spinning Crystal for the cream and turquoise striped silk ball dress, and Second Wedding for the rose-point and satin dress. My friends in California (who helped name the dresses), writers and painters, would like copies." Historical significance: A well-documented and named dress from this little-known but extremely talented Anglo-American couturier's final collection. Dress from Matilda Etches' last collection, displayed in Los Angeles, California, on Sunset Boulevard. Although shown in California, acquisition file describes this dress as English.